ROUND ROCK, Texas - The Pacific Coast League announced Thursday that Del Crandall, Lou Novikoff, and Gaylord Perry will be inducted into the PCL Hall of Fame as the three members of the Class of 2015. Del Crandall, born on March 5, 1930, in Ontario, California, accumulated 470 wins and four PCL titles in six seasons at the helm of the Albuquerque Dukes from 1978-1983. His championship total is the third-most for a manager in league history. His 1981 club, ranked 11th-best team in Minor League Baseball history, won 94 games and holds a PCL modern-era record with a .712 winning percentage. Sporting News named him the Minor League Manager of the Year that season. The Southern California native managed 42 games for the Dukes in 1983 before becoming the Seattle Mariners' skipper on June 25. Crandall currently resides in Los Angeles, California. Lou Novikoff, born on Oct. 12, 1915, in Glendale, Arizona, never hit lower than .301 in six seasons in the PCL. The outfielder earned the league's Triple Crown in 1940 with a .363 average, 41 home runs, and 171 RBIs. 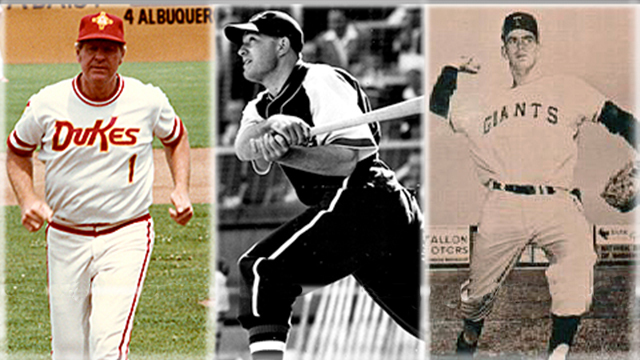 He is one of seven players to win the PCL's Triple Crown since 1922. Novioff also helped the Los Angeles Angels in 1940 to their second-straight PCL Championship Series. Sporting News named him the 1939 Minor League Player of the Year, after playing in three different leagues including his first in the PCL. He made his MLB debut in 1941 with the Chicago Cubs and stayed with the team for four seasons. Novikoff died in 1970 in South Gate, Calif., at the age of 54. Gaylord Perry, born Sept. 15, 1938, in Williamston, North Carolina, was the PCL Pitcher of the Year in 1961 and won a league-best 16 games to help the Tacoma Giants win the PCL Championship that season. The following year he owned the best ERA in the league with a 2.48 mark. Perry's combined 2.50 ERA in his four years in the PCL is the fourth-best all-time for Tacoma. The Campbell University (NC) alum went on to pitch 22 years in the majors, winning 314 games and two Cy Young Awards. He was inducted into the National Baseball Hall of Fame in 1991 and is just the seventh player in both the PCL and National Baseball HOF. Perry currently resides in Spruce Pine, North Carolina. Created by the Helms Athletic Foundation of Los Angeles in 1942, the original Pacific Coast League Hall of Fame was founded to honor those players, managers or executives who contributed most to the ideals of the league. In 1952, the Hall of Fame ceased operation until in 2003, as part of the league's Centennial Celebration, it was revived and inducted a class of 20 new members. With the addition of the Class of 2015, the PCL's Hall of Fame consists of 103 members. More information on the PCL Hall of Fame is available at www.pclbaseball.com.